This glimpsing Brown is presented on a striking piece of River Driftwood Burl. Image doesn’t begin to do it justice. Love these little Wild Rainbows, it takes me back to The Little Pigeon river near Gatlinburg, Tennessee where I caught my first ones.Id caught Rainbows before but these were the prettiest ones I’d ever seen. Every time I create one of these Wild ones, my mind goes racing back to that little stream, in fact, I’m kinda thinking about that right now! The creation of stylized works are among my favorites. Driftwood just speaks to me and tells me what it wants to be. 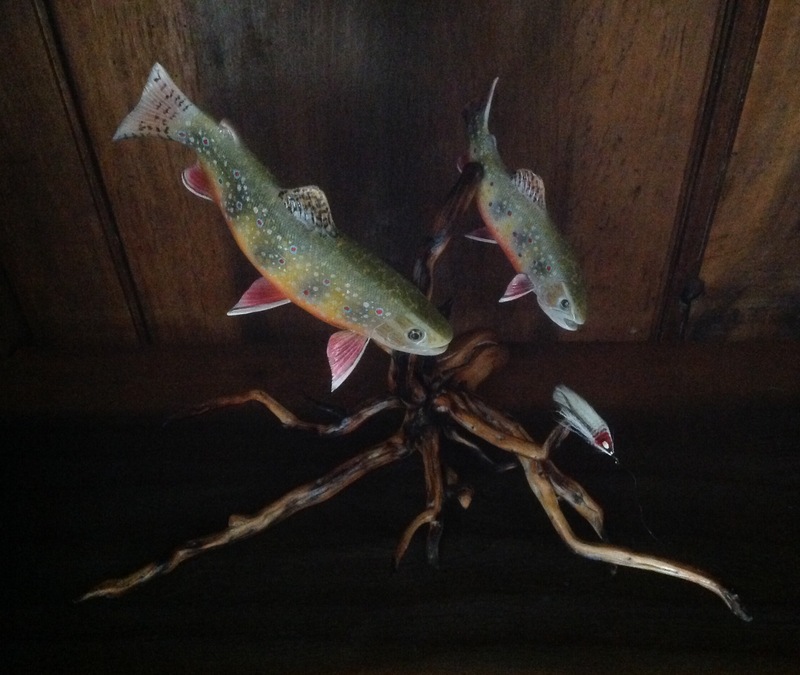 This Cedar root wanted to be a rising Trout, so, —– I helped it out. Really , who wants to argue with a Cedar root, I’ve tried but seldom win. In viewing the result, I think it had a pretty good idea. This pair of Brookies are in attack mode dashing toward a beautiful Streamer fly created by Selene Dumaine, master fly tier from Maine. 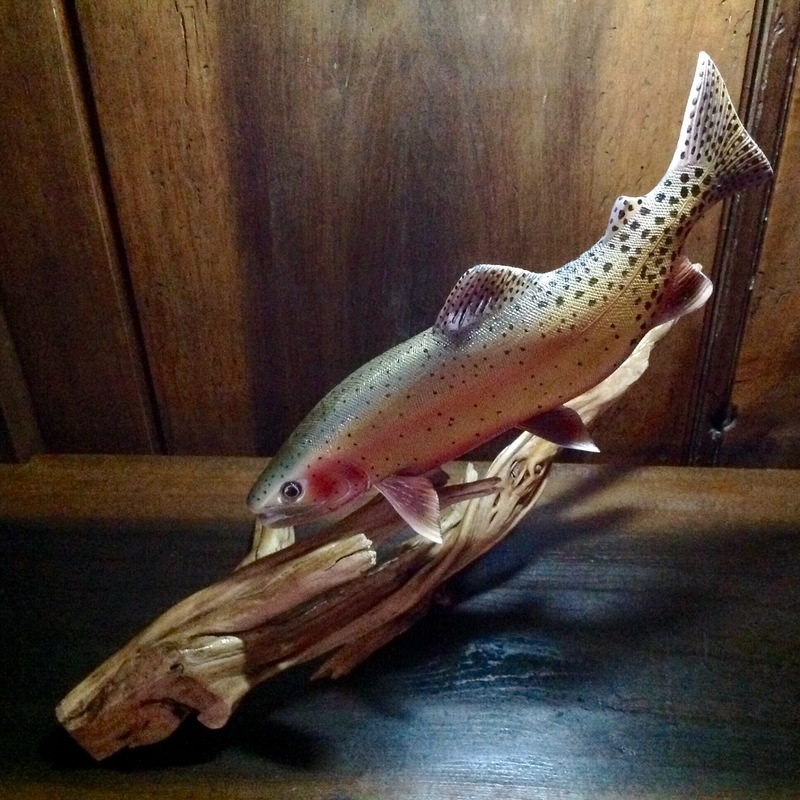 The gorgeous Mountain Driftwood was picked out for me by Pat Reicher, owner of Oregon Natural Manzanita Designs.The beauty of a Brook Trout is from the mind of God and he has blessed me with a gift of creating an imitation. 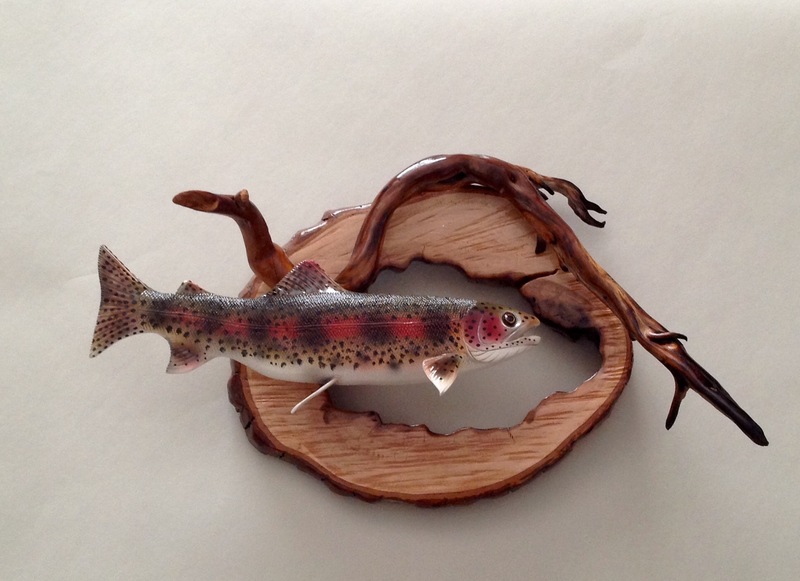 This work will be available for purchase in my GALLERY on Facebook Wiley Trout. Little eight inch Wild Brown Trout pulling a Stonefly Nymph off a log. This creation is sculpted from Tupelo wood, a Swamp tree that grows in southern Mississippi, and Louisiana, the blooms are the source of Tupelo honey, the purest there is. This work is presented on a beautiful piece of Manzanita from Oregon Natural Manzanita Designs. I LOVE THIS PIECE! 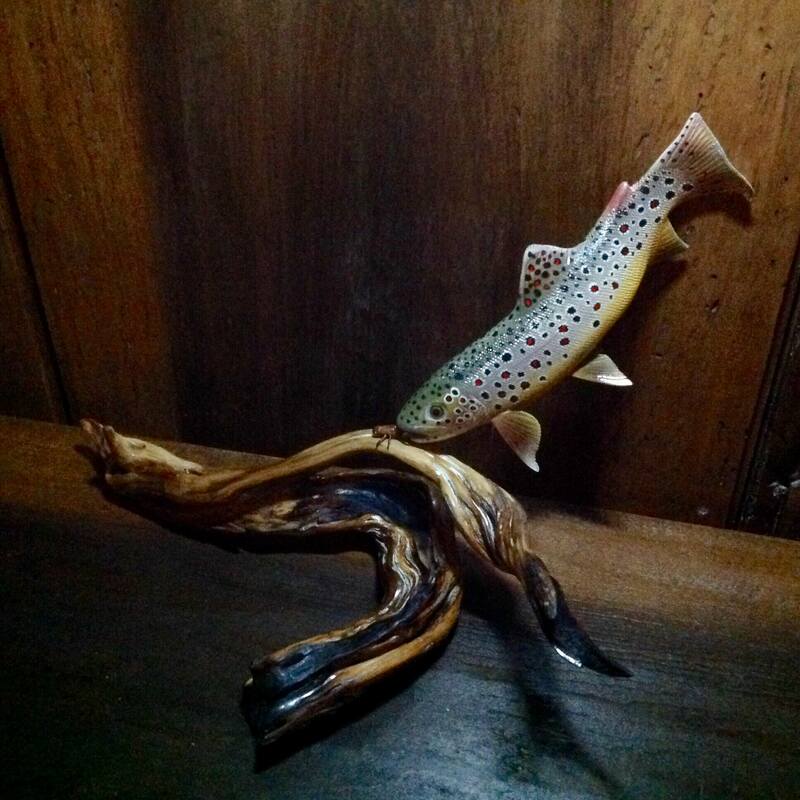 This little ten inch Rainbow is created from Tupelo wood and presented on a beautiful Manzanita branch, it is then attached to hollowed out Sweet Gum tree round.These little Wild ” Bows” send my mind whirring into wonderful memories , while I can’t Wade those little streams anymore, I can still think about it and create in my studio new memories, and I do ! 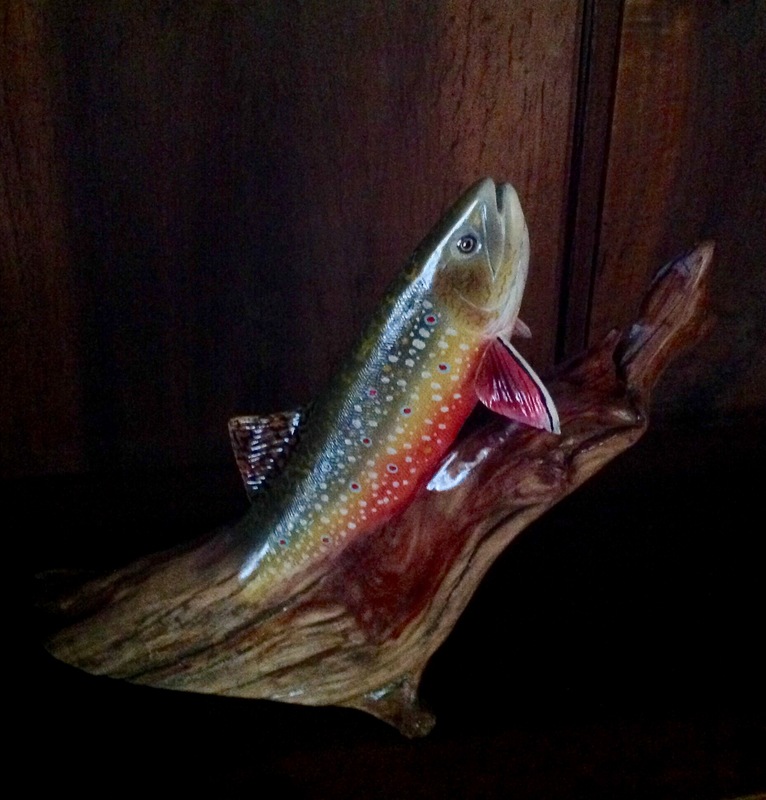 Emerging Brookie, some of my favorite creations are stylized works. 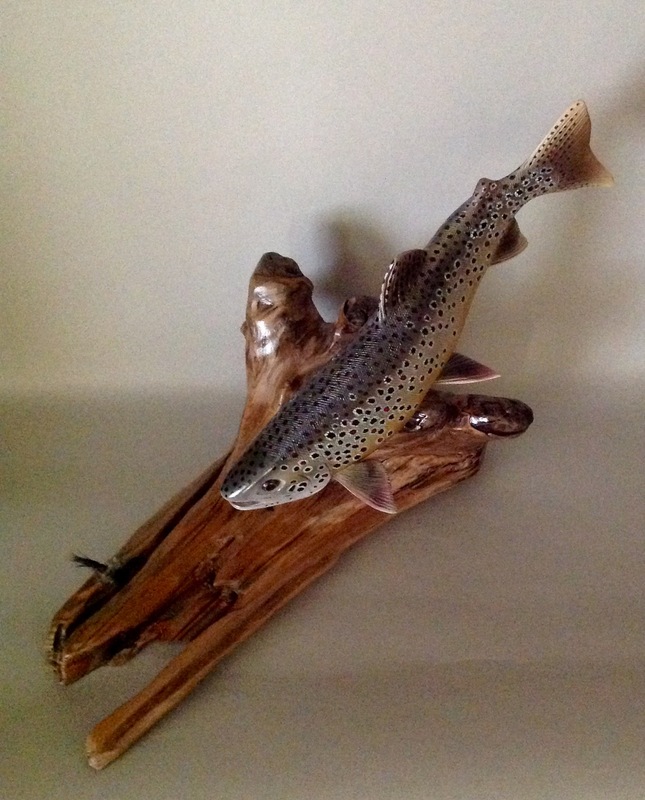 This Cedar root spoke to me saying ” I want to be a rising Trout “. Well, how can one argue with a Cedar root? Based on results, it seems to have had a pretty good idea.